Bed bath and beyond is one of north America’s most trusted names in bedding, slipcovers, towels and much, much more in the name of home accessories alone. They have everything you need to make your home a comfortable haven for competitive prices and imported materials. Practical, stylish linen sets and a variety of essentials and accessories are available for every room in the house. Get Huge Savings on select Christmas merchandise at Bed Bath and Beyond during their Boxing Day sales and deals Canada 2013. Starting Boxing Day Thursday, December 26th 2013 receive 50% off while supplies last. Don't miss this Boxing Day Sale at Bed Bath and Beyond. 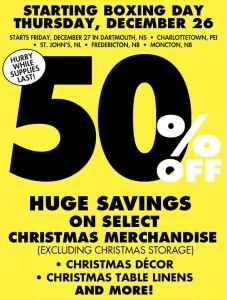 Beginning December 26th, there will be huge savings to be made in store on all Christmas merchandise. Enjoy 50% off on Christmas décor, table linens, and much much more (excluding storage). Find the nearest Bed, Bath, and Beyond location and hurry in to reap the benefits of this sale; it is a limited-time offer and supplies will not last the holiday.